Carrousel agar/media filler stacks dishes in user freindly removable racks. 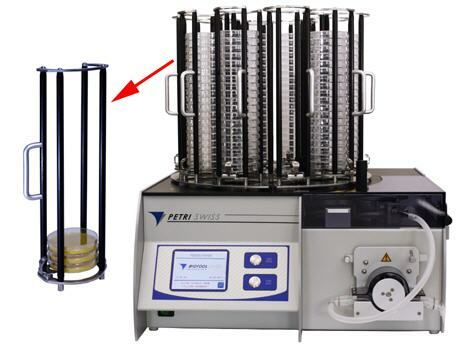 The unique removable PetriRack system allows Petri dishes to be loaded into the rack at any time minimizing refill down time. Neutec Group is proud to offer innovative agar plate filler systems by Biotool Swiss. The carrousel filler with the removable rack for safe and effortless dish loading PetriSwiss PS200 automatically fills and stacks dishes in removable safety racks. This unique, removable rack principle allows racks to be prefilled and loaded onto the rack disk at any time. The dishes can remain stored in the rack, in a safe and stable stand. The unit down time for a refill is minimal! Automatically fills and stacks dishes in removable safety racks. The unit takes the lowest dish from the stack and places the dish separated from its lid into the UV protected filling chamber. While filling this dish, the unit simultaneously stacks the previously filled dish and prepares the next dish to be filled. As soon as one PetriRack is processed completely, the unit moves the complete magazine disk by one position and restarts this process until all columns are processed. The unit stops after one full round and allows to replace all dishes manually or by replacing with prefilled racks. This unique removable rack principle allows that racks can be prefilled and loaded onto the rack disk at any time. The dishes can remain stored in the rack, in a safe and stable stand. The unit down time for a refill is minimal! The PS200/400 can be connected to an external Ink Jet that will print on the side of the dish information such as sample ID, batch number, date or a barcode. The unit will need to be pre-ordered from the factory as "printer ready" and we will be happy to connect you to the local InkJet dealer who can offer you the printer itself and supplies. BioTool’s media preparator Proficlave PC10 Sterilizer prepares up to 9 or 16 liters of plain or complex vitamin / blood added agar formulations, easier and faster than ever. Supply Voltage: mains voltage 85 - 132 VAC and 176 - 264 VAC 47 - 63 Hz. Ambient Temperature +5ºC to 45ºC Also during transport. Support Sturdy support surface with a load-bearing capacity of at least 50 Kg. Suitable dish Diameters 89 - 96 mm. Suitable Dish Heights 14 - 20.5 mm. Dosing Quantity 1.0 - 99.9 ml. Delivery Rate Approx. 800 ml. / min. PetriSwiss Mini PS 20, what an agar filler time saver. Just push a button and walk away. It couldn’t be easier, and it has the flexibility to adapt to any situation..
We run 250 students through our general microbiology course each semester. Prep room space is always at a premium. The PS20 allows the same amount of plates to be made with about 10 feet of counter space. We save time repackaging our agar filled plates because the plates are automatically stacked by the instrument. We have not had any contamination problems because the lid is removed for a very short time under the instrument’s UV light. My tech says that the entire process is quicker than manual pouring because we can make bigger batches without contamination worries.